While I’ve devoured all of Chandler’s books, I’ve hardly read any Hammett. Way back when I started this blog, I read and reviewed The Glass Key – book and movie – and while I liked it, I never returned to him until now. Although I had both The Maltese Falcon and The Thin Man on my piles, I picked the latter. I’m pretty sure they are not in the same league and it wasn’t s as hard-boiled or noir as I expected. On the contrary. It has even some elements of a screwball comedy. It’s the Christmas season and our hero, Nick Charles, is back in New York with his young wife Nora and their schnauzer Asta. Nick used to be a PI in New York before he met Nora and followed her to San Francisco where they share a business. While waiting in a speakeasy for his wife who is Christmas shopping, a young woman walks up to him and introduces herself as Dorothy Wynant. Nick used to know her father and her when she was a kid. Dorothy hopes he’s got her’ father’s address but he hasn’t. He hasn’t heard from Wynant in years. Shortly after this encounter, Nick hears that Wynant’s secretary and former lover Julia Wolf has been found dead, shot four times, and that Wynant is missing. Interestingly, the dying Julia has been found by Wynant’s ex-wife, the manipulative, bitchy Mimi. Everyone, including the police, is convinced that Wynant shot Julia, only Nick doubts this. While the readers are kept guessing who shot Julia, I can’t say that the crime-solving is the most interesting element in this story. What I enjoyed the most is the description of the couple Nick and Nora and the way they spend their days and nights. Most of the story takes place in their hotel room and a huge number of people drifts in and out. Friends, acquaintances, police men, criminals. Every one is constantly downing a drink. The last thing Nick does before he goes to bed – drink, the first thing he does when he gets up – he pours himself another drink. Nora and the others aren’t much better. Nora might not be the best developed character but she’s fun. She’s the opposite of a nagging housewife. No matter what Nick does or what happens to him, she never gives him a hard time, never freaks out. She’s almost twenty years younger than her husband and very fascinated by his old life. When he’s dragged into the investigation of Julia’s murder, she joins him eagerly and tries to help him find out who killed her. The tone and humour throughout the book, especially in the dialogue is very dry. Not as dark as in other novels of the era but refreshingly brittle. I only found out after finishing this novel that Hammett wrote it for the women’s magazine Redbook where it was serialised in 1934. That may explain why it’s not as dark and why there are so many female main characters. There’s Nora, Nick’s wife, the hysterical Dorothy, Mimi, her bitchy mother and Dorothy’s aunt. The male characters are rather pale in comparison. 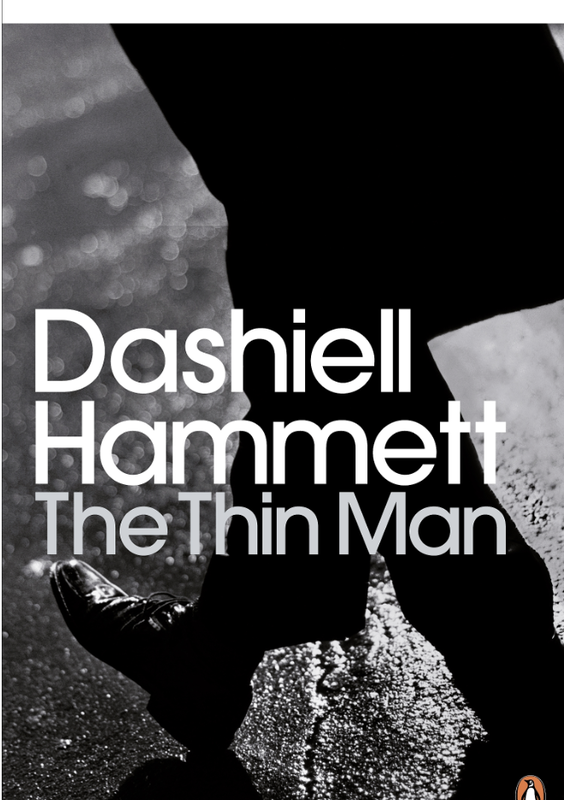 The THin Man is certainly not Hammett’s best but it’s fun. I love The Thin Man films. And you’re right about that screwball element. Good to know. I’ll have to watch them then. Nice review, Caroline. I have ‘The Thin Man’ on my shelf. Hope to read it sometime. Interesting to know that story is less about solving the murder and more about the interactions of the main characters. Your observation about Nick drinking all the time made me smile 🙂 It is amazing how much the main characters drink in stories! It’s so good to see your take on this book, Caroline. I read The Thin Man (and The Maltese Falcon) when I was quite young and would like to revisit them one day. Your post brings it all rushing right back! I don’t think I’ve seem the film of this one, but John Huston’s adaptation of The Maltese Falcon is a firm favourite. There is a screwball element to it, for sure. I really need to read The Maltese Falcon and then watch the movie. Again? Not sure I’ve seen it but I think I have. This was more fun than serious. Not bad at all but The Glass Key was way better. The movie is great – Powell and Loy are amazing and seem to be constantly drunk ,and screwball is the right word for it! I love Hammett – he’s very dark in some of his books but his writing is just so good. I’ve never got on with Chandler but I love Dash! Really? You don’t get along with Chandler? I love him. Did you try The Long Goodbye? Thanks for the heads up on the movie. It sounds like fun. His writing is tight. I tried Chandler a long time ago but I can’t recall which one. Maybe I’ll give him another chance! I saw the movie a few years ago and thought it was very entertaining. Not dark at all. Now I’m intrigued by the book and may have to read it. Apparently the movie’s diferent. The book is enterating as well though. Quite different from his other novels, it seems. I saw the movie a long time ago. I remember liking it. I have not read many books of this type. I think that I need to take a couple of months and explore a few. I’m convinced you’d like Chandler and some of the darker Hammetts. I’ve got his short story collection which is said to be very good. Hi, Caroline. Yes, the movie “The Thin Man” is very good, and I believe unless I’m mistaken that I’ve also seen something called “The Return of the Thin Man.” Romping good fun, the first one, but I can’t remember what the second one was about. Thanks Victoria. “Romping good fun” is something I could use. The Thin Man is great. I’m delighted you enjoyed it. It’s not noir certainly, or hardboiled or whatever, but it is huge fun and not at all what people expect from Hammett. I didn’t know the women’s magazine detail; seeing how good the result is though I wish he’d been commissioned by more of them. I reread (and reviewed) The Maltese Falcon myself recently. It’s fame is partly born of the movie but it is very good. I think you’ll enjoy it when you get to it. Yes, it was fun and nothing I expected. Glad to hera you enjoyed it as well. I found it rather interesting that it was written for a women’s magazine. Unlike some other reviewers, I found the women were strong characters and I liked the couple. I don’t think I’ve seen your review. I’ll have to check it oit. It’s the next one of his I’m going to read.